Here is another evidence of the Armenian Genocide, in fact, its being a Big Lie.. The Armenians have been lying with a massacre of 1,500,000 Armenians in their so-called genocide between 1915 and 1923. However the population statistics of the races that were drawn by the Armenian Patriarchate of Constantinople in 1912 (click the thumbnail in the right-hand-side) is not consistent with the death number of Armenians. In fact, Turkish civilians were massacred! At the Paris Peace Conference (1919), Boghus Nubar, the head of the Armenian Delegation, stated in the conference that 280,000 Armenians had been remained in the lands of the Ottoman Empire and 700,000 had emigrated. Georger Montgomery with the U.S. Emissary and Armenian - America Society claimed of a population for Armenians with a population of 1.4 - 1.6 million before the so-called genocide and the number of deaths as 500,000. Van Cardashian, drew a number of casualties as 750,000 out of 1.5 million Armenian population in testimony before the Senate Foreign Relations Committee in 1919. Each exaggeration hasn't been recognized or been acquiesced by the poor politicians due to their foremost care of having vote by the Armenians. Historian Kevork Aslan, raised the exaggeration to an excessive level of 1.5 million at a first glance and then of 1.8 million. 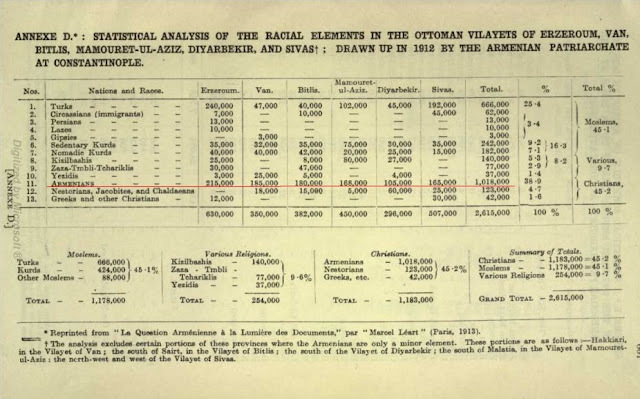 Let's check the "statistical analysis of the racial elements in the Ottoman vilayets of Erzurum, Van, Bitlis, Mamouret-Ul-Aziz, Diyarbekir, and Sivas" which was drawn in 1912 by the Armenian Patriarchate of Constantinople.